are qualified 12th class in Science group they can submit their application form online or before 11-January-2018. Online applications link will active from 11-12-2017 @ https://cisfrectt.in/. Selection for CISF Constable Fire vacancies will be held through written test, physical standard and endurance test, Trade Test. These Constable Fire recruitment of CISF is temporary basis. For more details regarding CISF Fire Constable jobs see the information given below. 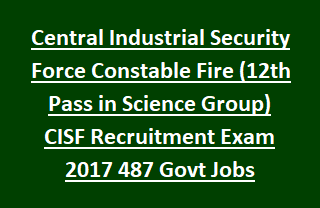 There are total 487 vacancies available in this current recruitment of Central Industrial Security Force. 10% of vacancies are reserved for the Ex Serviceman. As on 11-01-2018 candidates age limits are 18-23 years. SC ST candidates years and for OBC candidates 3 years of age relaxation is given. For Ex Serviceman age limits refer official notification. The candidate must have qualified 12th class/Inter with Science Subject form a recognized state or central board. For Tribal/Adivasi candidates height is 162.5 cms and Chest-77+5 cms. No PET for Ex Serviceman. Written test will be conducted for 100 marks and total 100 objective type questions will be given. Exam syllabus will be 12th class level for General Science and 10th class level for Aptitude. For General & Ex-servicemen : 35% and for SC/ST/OBC : 33%. Final Merit list will be prepared based on all the selection process. Eligible qualifications having candidates can submit the applications online on before 11-01-2018 by 05:00 PM through https://cisfrectt.in/. Admit Card details, reservation details, Exam Date and all other information about CISF Constable Fire Jobs are available in this website only.